Welcome to Peacocks and Paisleys . 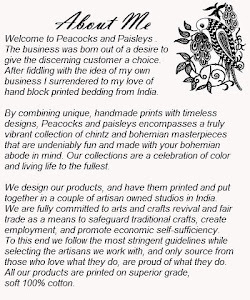 The business was born out of a desire to give the discerning customer a choice.After fiddling with the idea of my own business I surrendered to my love of hand block printed bedding from India. By combining unique, handmade prints with timeless designs, Peacocks and paisleys encompasses a truly vibrant collection of chintz and bohemian masterpieces that are undeniably fun...and made with your bohemian abode in mind. Our collections are a celebration of color and living life to the fullest. 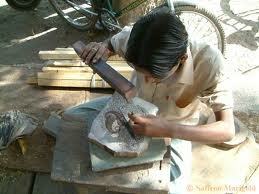 We design our products, and have them printed and put together in a couple of artisan owned studios in India. We are fully committed to arts and crafts revival and fair trade as a means to safeguard traditional crafts, create employment, and promote economic self-sufficiency. To this end we follow the most stringent guidelines while selecting the artisans we work with, and only source from those who love what they do, are proud of what they do.All our products are printed on superior grade, soft 100% cotton .